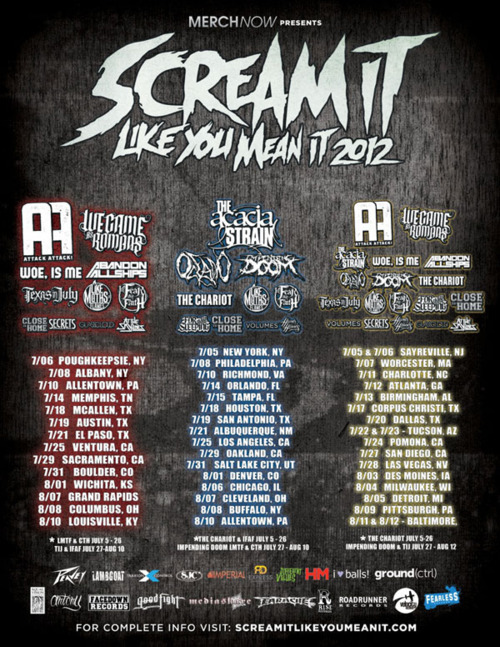 The Scream It Like You Mean It Tour will be coming to Allentown at Crocodile Rock Cafe – twice. The tour features two concurrent-running tours with differing bands. The first time the tour will hit the valley is on July 10th and will feature headliners Attack Attack! and We Came As Romans along with supporting bands Woe Is Me, Abandon All Ships, Like Moths To Flames, Close to Home, Secrets, Class Cloud, and At The Skylines. The tour will then return one month later on August 10th with headliners The Acacia Strain with supporting bands Oceano, Impending Doom, Like Months to Flames, Close to Home, For All Those Sleeping, and Hands Like Houses. VIP sales (including t-shirt, laminate pass, poster, and meet & greets) go on sale May 14th and general admission sales go on sale May 18th. Also, this is the shittiest, most terribly designed, confusing tour poster in all of history.